Needlework or Hand-Made Treasures I've Rescued â€“ Have you ever found or purchased someone's needlework that has been thrown away or that you have found at a yard/garage sale or thrift store? Maybe you purchased needlework or handmade items on EBay or at an auction sale! I have! I would love to hear about your "finds" and show a picture of it, if you would be so kind as to indulge with me in this new inter-active topic! The old saying, "One woman's trash is another's treasure!" is oh, so true. I shared my rescued treasures in my last newsletter. Here is one more! Roz - you have touched on a subject near and dear to my heart this time! I scour thrift stores and finding bits and pieces of embroidery and handwork makes my day. I too appreciate the care and love and work that went into making them and cannot stand to see them languishing in a rag bin. So, I rescue them and bring them home and wait for them to speak to me about their new purpose. Some of course I keep as they are and simply enjoy them. Some, especially vintage laces and tatting, find their way into my crazy quilting projects. Some of them, however, I love to make into items that will be used and enjoyed by others who appreciate stitching. Wow â€“ thank you for writing, Kerry! I love your ideas for upcycling and repurposing. Please share your Rescued Needlework stories with us. I have been having a blast playing with my new computer program, Easygrapher Stitch Wiz. It allows you to make diagrams of stitches - I wish I had had this when I was actively posting on the Build a Seam (BAS) stitches! I may just have to take it up again - I wonder if anyone would be interested? Before I had this program, this is how I would do my stitch diagrams, by showing the progression of the stitch with needle and thread and then long, windy descriptions of where to bring your needle up and take it down in which direction. Now I can do the same thing with the arrows and little numbers I can put on the stitch lines in the diagram. Still figuring out the ins and outs of the program and how to get the arrows where you can see them! If you start on the end with the number on this diagram though, you will be going the right way. So, after a long absence, Double Cross Stitch is the next BAS. It is a useful little stitch that makes a nice dense line or you can space them out and add a bead or other stitch in between. I love making ATCs (Artist Trading Cards). They are the perfect place to try something new or experiment with a stitch or technique. Yesterday I wanted to make an ATC for a sweet lady I know so decided I would use Silk Ribbon Embroidery to make her a bouquet of flowers. Of course, I had to try something new so in this case it was toothpick roses. You wrap the ribbon around a toothpick, forming the rose, and then slide it off and use little backstitches to keep it all together. It was fun to try but a little too fiddly and small for my big fingers to enjoy - the joys of having "man hands"! lol So, I don't think it is a technique I will fall in love with. I am generally pleased with the total effect of the bouquet though and hope the recipient enjoys them. I found a couple days to stitch this week on my stitching for pleasure project (as opposed to stitching for deadlines projects! lol). I am working on Diane Scott's "Apple a Day", a three dimensional canvaswork apple and thoroughly enjoying it. Since I am still new to canvaswork, this is a bit of a stretch for me and I can see quite a few mistakes I would like to fix. I have already done a substantial amount of frogging (ripit! ripit!) though and am running low on threads and having to make substitutions from my stash already.So, I will leave my errors to the end and see if I have sufficient amounts of the correct threads to fix them then. If not, they will end up being "personal adaptations to a commercial design". I took part in another ATC exchange, on EAC Virtual Threads this time. Unfortunately, my camera was missing in action when I made mine so not able to share unless someone posts photos of them. I am very happy to share a photo of this one I received from Linda though. Isn't it the most gorgeous stitching?! Just beautiful - I love it! Thank you Linda! One of the things that has been keeping me out of mischief is starting on the Beginner Counted Thread Correspondence Course from The Embroiderers' Association of Canada. This is an individual course so is quite unlike the group courses I have taken before. The group courses center around a project - you have three or so months to finish the project and ta-dah! you are done. The individual courses are more study courses where you do samples, research, etc. Lots of information on the correct way to do things and little hints along the way to improve your stitching. So, even though I've done a fair bit of counted thread work, I am starting with the beginner one and so far I am happy I did. You are allowed 18 months to finish the six lessons in this course. You send each lesson in and make whatever corrections are necessary when you get it back. You end up with a huge binder of wonderful resource material although by the way lesson one went, I don't think one binder will do it, lol. These are my pages from Lesson One ready to be packaged up and sent off in the mail to my counsellor. It looks like a small pile but only a fraction of the pages need to be corrected along the way - the rest will be reviewed when I submit the whole binder at the end. This little pile of pages actually represents quite a bit of work though! So, keep your fingers crossed for me that I don't need to re-do too much of it! While I am waiting for it to come back, I'll be starting on lesson 2 - blackwork! Where did I go to this time? 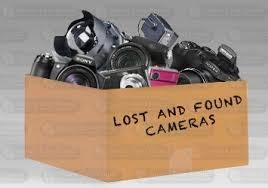 I have been quiet again and this time it is because I lost my camera! Finally found it and will be taking some photos of what I have been working on to share.